Technology… Just about everyone has a smart phone, i-pad or digital camera. Many couples have opted to have a tech free wedding. Let your guests know that you want them to support your ceremony by turning off their gadget and being there with you. This can be done with signs or as part of your wedding program. Make your own tradition… You’re at the beach and events are normally less formal. 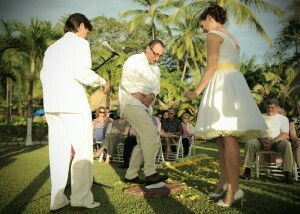 You can work with the officiant to create your own ceremony. 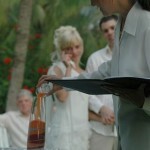 Often I see blended traditions that can be part of the wedding. Recently I had a Jewish and Basque wedding. One tradition was breaking of a glass which marked the conclusion of the ceremony. With shouts of “Mazel Tov. During the reception a wine skin was passed around the room for the guests. There are no rules when it comes to creating your wedding with your personal traditions. Here’s a link to an article that gives a little more information. This entry was posted in Jewish Weddings, Wedding Ceremony, Wedding Etiquette, Wedding Gifts, Wedding Locations, Wedding Planning by Randy Gritz. Bookmark the permalink.